Here is the formula I use at my home for all-purpose spray cleaning. It is particularly handy to use this all-purpose spray to get all the baseboard heaters cleaned and free of dust. I like to avoid the fried dust smell that is so unhealthy to breathe. This spray cleaner only costs 9 cents for 32 ounces, compared to $2.94 for the standard commercial version, and I can vouch for the fact that it works as well. Besides, it is safe to have around children and your own lungs. This formula makes 2 cups of formula, and it works on most types of dirt. Combine the minerals, soap or detergent, and water in a spray bottle. Shake to blend. Spritz the area every foot or so, and wipe clean with a clean soft rag as you go. 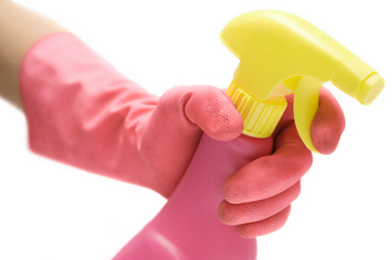 For difficult dirt, spray and leave the cleanser on the surface for five minutes or so before wiping. This is cheap but it sure isn't green or clean! DO NOT USE BORAX if you have pets unless you rinse the area EXTREMELY WELL! They will lick their paws and ingest it if you use it on floors or any place they go! Washing soda is scented, so it is NOT non-toxic! It also needs to be rinsed or it will leave a slimy and sticky residue that simply attracts dirt to build up on the surface where it was used. Using liquid soap or detergent is usually not non-toxic. It also needs to be rinsed or it will leave a slimy and sticky residue that simply attracts dirt to build up on the surface where it was used. If you want non-toxic efficient cleaning that kills germs, you have to get a live steam cleaner...and they do a most excellent job and leave no residue and the house stays cleaner and disinfected for longer! Thank you what a great article. Love these type of tips!